Fr. Theodore Ziton, formerly of St. George Cathedral in Wichita, Kansas (1963-66) and retired from St. George Church in Canton, Ohio, fell asleep in Christ this past Friday, April 8th. He is the father of Fr. Stephen Ziton, formerly of St. Mary Church in Wichita. Fr. Theodore was preceded in death by Khouriya Vivian. The schedule of divine services for Fr. Theodore (all to be held at St. George Church in Canton, OH) is as follows: Thursday, April 14th - special funeral service for a priest at 7:15PM; Friday, April 15th - usual funeral service at 10:30AM followed by graveside prayers, interment and the meal of mercy. 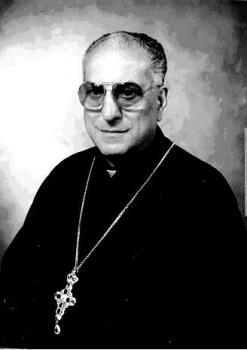 The St. George Antiochian Orthodox Church in Canton, Ohio mourns the loss of their longtime pastor, The Very Rev. Fr. Theodore Ziton, who served the parish from 1975 to 1996. He passed away this past Friday, April 8, 2011. Fr. “Ted” was born in Toledo’s north end neighborhood on August 7, 1929, the second of three boys, to Julia (Sabback) and Elias K Ziton. After high school graduation with honors, he attended the University of Toledo then transferred to Columbia University in New York when he was accepted into St. Vladimir’s Orthodox Theological Seminary. He attended both institutions simultaneously, and in June ‘54 he graduated with a Bachelor’s degree in Science and a Master’s in Divinity. On June 6, 1954 he married Vivian Zahka of Boston, MA, and was ordained to the Holy Diaconate on June 20th of that month during the Midwest conference in Charleston, WV. On August 29th of 1954 he was ordained to the Holy Priesthood at the Archdiocesan Convention hosted by his home parish of St. Elias in Toledo. Both ordinations were concelebrated by Metropolitan Archbishops Antony Bashir and Samuel David, one of the few priests to have that honor. His first assignment was at St. Nicholas Church in Montreal, Province of Quebec, Canada as assistant under The V. Rev. Fr. Michael Zarbatany. Upon Zarbatany’s retirement, Fr. Ziton became pastor until 1962. During his time in Montreal, he and Fr. Michael Shaheen of Canton, then pastor of St. George, Montreal, took the unusual steps of regularly appearing at the other church’s functions and other public events in a show of unity between the two Archdioceses of New York and Toledo. Between 1962 and 1973 Fr. Ziton pastored churches in Vicksburg, MS; Wichita, KS; New Kensington, PA, and Indianapolis, IN. During this time he was recognized as a preeminent speaker, writer, and leading figure in the archdiocese. He was a frequent contributor and featured writer for The Word Magazine (the religious publication of the archdiocese), would routinely preach at regional and national conferences, and produced a weekly church bulletin that was recognized as the best in the archdiocese for three consecutive years. He was also featured on radio broadcasts and had a Liturgy televised in efforts to heighten the profile of the Orthodox Church. In 1967 Fr. Ziton was a member of the New York Archdiocese delegation that traveled to Lebanon and Syria and successfully petitioned for the consecration of Fr. Philip Saliba to succeed the late Met. Bashir. In 1975 he helped orchestrate a unification of the two dioceses when Metropolitan Michael accepted the role of Archbishop under Metropolitan Philip. Their first concelebrated Divine Liturgy in Canton occurred in May 1983 at St George, following the church’s major renovation between 1979 and 1982. At the conclusion of this service Fr. Ziton was elevated to Archpriest, the highest rank attained for married Orthodox clergy. Friends and family will be received at St. George Church (1118 Cherry Ave. NE) for calling hours from 2-4 and 5-7 pm on Thursday and there will be the Funeral Service for a Priest at 7:15. There will also be a Funeral Service at 10:30 am followed by burial. Bishop THOMAS of the Diocese of Charleston, W.V., Pittsburgh and the East will be presiding over the services.